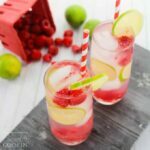 A delicious and refreshing raspberry summer cocktail, this Raspberry Gin Rickey is a fun, fruity drink with the perfect amount of sweet-and-tart! This Gin Rickey is a classic gin cocktail that was first made in a shoemaker’s bar in Washington, DC in the 1880s. By the 1890s, “soda fountains” had started popping up in pharmacies, with pharmacists doling out everything from mineral salt-enhanced waters to milkshakes, sodas, and cocktails like this! There were even books and manuals put out listing the healing properties of all the sodas and cocktails that could be found in the nation’s soda fountains. 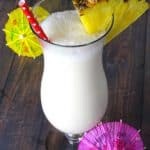 Even with prohibition, the gin rickey remained in soda fountains as the lime kick was enough to convince people they were having a cocktail even when they weren’t! 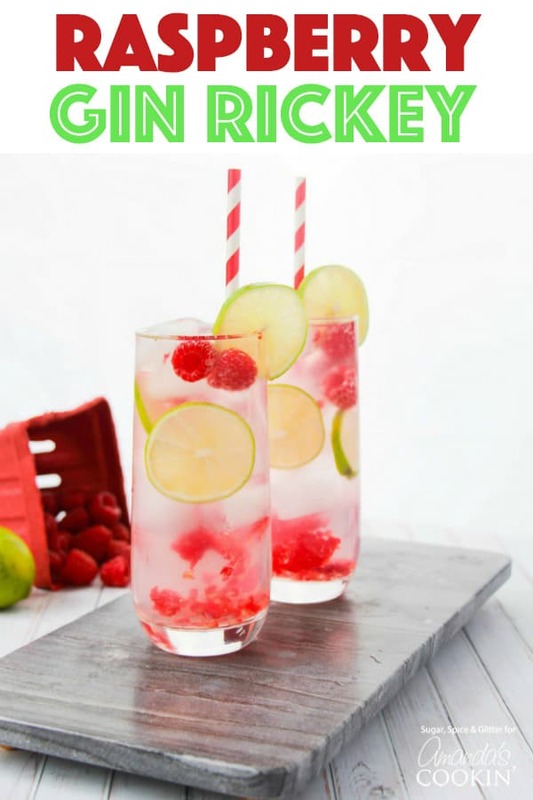 Depending on where you are from, a gin rickey was supposed to either have a strong lime flavor, or a raspberry-lime (New England) or cherry-lime (New York) flavor. 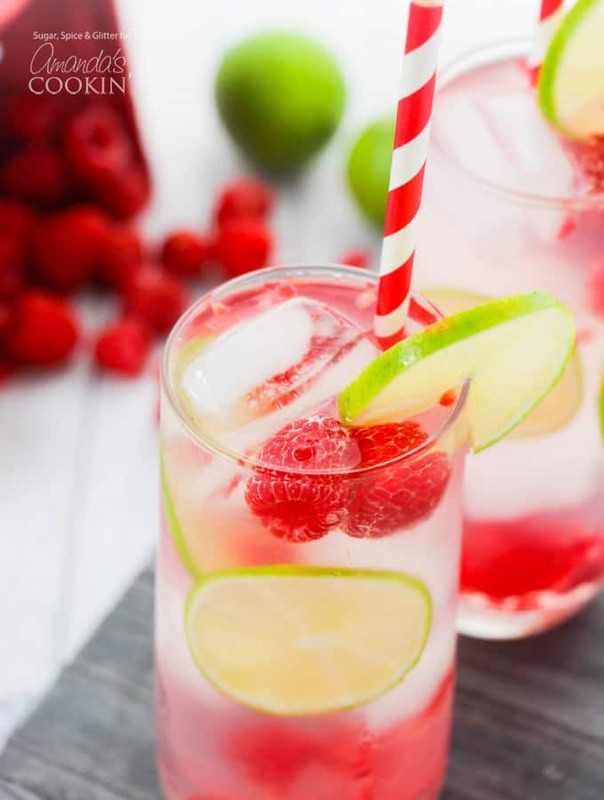 Since we all know that New Englanders know how to do summer, we’re looking to them for our inspiration for this delicious, thirst-quenching Raspberry Lime Gin Rickey recipe. Pair it with my Lobster Roll Sliders for a truly New England-style summer get-together! Note: if you already have simple syrup, swap that in for the first two ingredients. In a small pot, combine the sugar and 1/2 cup water. Heat over medium-high heat until the mixture comes to a boil and the sugar dissolves. 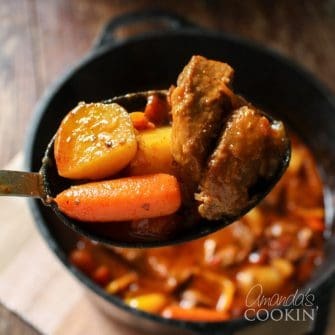 Remove from heat and allow to cool, approximately 10 minutes. You have just made your own simple syrup! 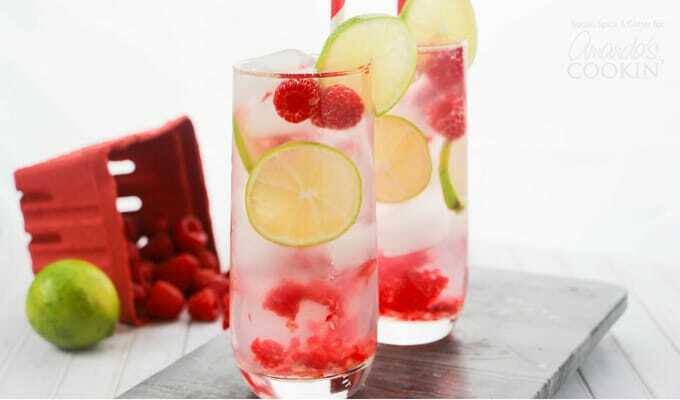 Meanwhile, slice your limes and muddle 2-3 raspberries in the bottom of each serving glass. (If you have an ice maker, gather about 4 cups of ice. 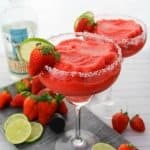 Add 2 Tablespoons lime juice, 2 Tablespoons simple syrup, and 3 Tablespoons gin to each glass, overtop of the raspberries. Top with 1 cup of ice and 1/2 cup of soda water. Garnish as desired, with lime slices and additional raspberries. 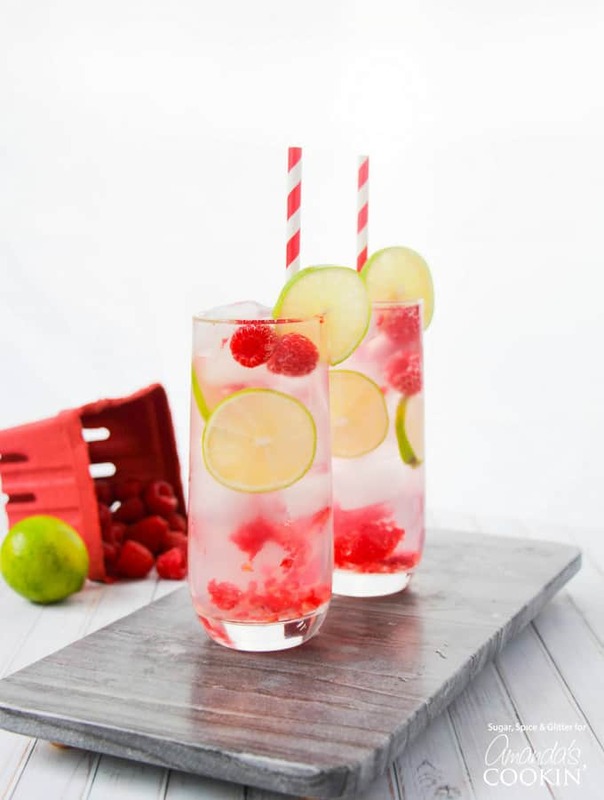 Do you have a summer party coming up that these Raspberry Gin Rickeys would be perfect for? 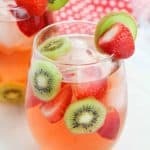 Check out more of our favorite summer cocktails! This Raspberry Gin Rickey is a fun, fruity drink with the perfect amount of sweet-and-tart! 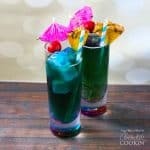 The perfect cocktail for your next summer party.